Ormesby St Margaret with Scratby Parish Council are starting Parish Surgeries to enable parishioners (who may not be able to attend parish council evening meetings) to meet with Parish Councillors and have an opportunity to discuss local issues on a Saturday morning on a monthly basis. 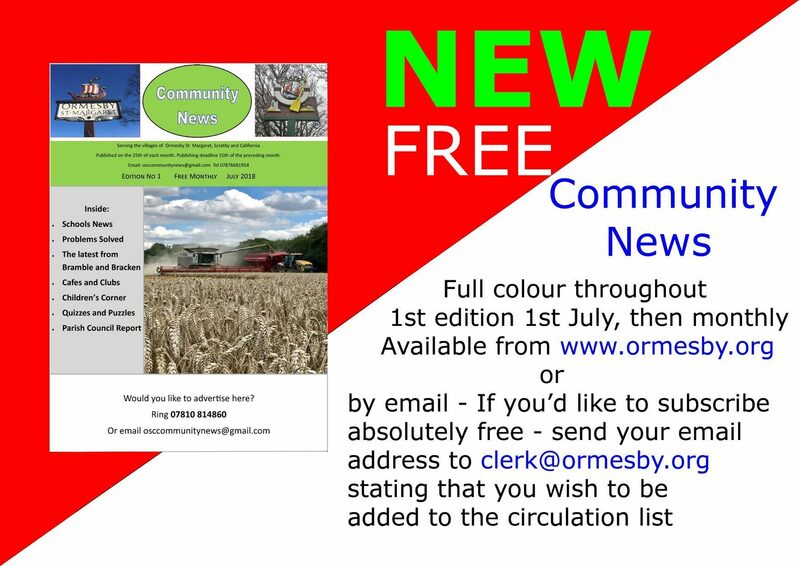 Please click on the link below to view the Community Newsletter. Can you spare an hour or two a week to listen to children read in a local primary school? Schoolreaders is looking for more volunteers in the Ormesby area to carry out this important role. 30 hours a week, mainly home based. Salary accords with National pay scales. The successful candidate will be highly organised and have good financial management, communication and IT skills. Congratulations and thank you to all those who contributed. Have Your Say – How can Great Yarmouth Borough Council help you be more active? Great Yarmouth Borough Council is working together with Active Norfolk to deepen their understanding of residents activity levels, and how local communities across the Borough access and use local facilities, and as part of this they are launching a borough wide public survey to ask residents for their views. Ormesby St Margaret with Scratby Parish Council are looking to co-opt a new Parish Councillor to fill a vacancy, representing Scratby Ward. If you are looking to do something positive and rewarding for your community, and want to help shape the future of your village, then the Parish Council would love to hear from you. 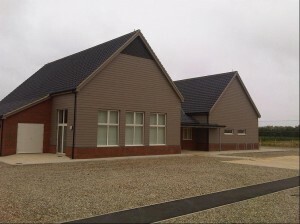 need to be available to attend the Parish Council Committee meetings held on the second Monday (evening) of each month. If you are interested in applying, please send your full details and covering letter explaining why you feel you would be suitable for the role to the Parish Clerk. The closing date is Friday 17th August 2018. See the attachment below for more information about a new weekly over 50s lunch club. 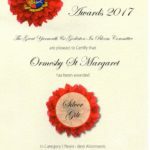 Notice is hereby given that a casual vacancy exists in the office of Parish Councillor for the Parish of Ormesby St Margaret (Scratby Ward). Ormesby St Margaret with Scratby Parish Council are looking to co-opt a new Parish Councillor to fill a vacancy, representing Ormesby Ward. If you are looking to do something positive and rewarding for your community, and want to help shape the future of your village, then the Parish Council would love to hear from you. The closing date is Friday 27th July 2018. Please click on the link below for information on the Hemsby Information Event on Thursday 21st June 2018. Notice is hereby given that a casual vacancy exists in the office of Parish Councillor for the Parish of Ormesby St Margaret (Ormesby Ward). Pre-bookable 30 minute advice sessions are being run from Ormesby Village Centre and All Saints Parish Hall (on alternate weeks), available every Wednesday from June 2018. The annual return for year ended 31.03.2018 can be found under the ‘Finance & Documents’ heading. The Parish Council is considering installing CCTV at the recreation ground to protect the public from crime and antisocial behaviour, to promote crime prevention and improve community safety, following instances of crime and antisocial behaviour at the ground. The system would be installed by Ormesby Lads Football club at no cost to the Parish and be run and managed solely by the Parish Council in accordance with all relevant Data Protection and Protection of Freedoms legislation. As the recreation ground is a public open space it is important that we undertake a public consultation before making this decision, and we are seeking your views as residents of the parish and users of the recreation ground as to whether or not you would support this initiative, and consider it a suitable deterrent. We welcome any comments you may have. Taking place from 14 May to 14 June, National Smile Month aims to promote and raise awareness of good oral health, and Ormesby Dental Care is getting involved to help achieve this. Filby Village Hall will be welcoming a theatre show on Saturday 5th May to perform ‘Songs of Victory’, which commemorates music, songs and sketches that helped “win the war”. The show features a talented cast which includes local professional singer, Sarah Probert who specialises in vintage songs and songs and medleys by the likes of Vera Lynn, Flanagan & Allen, The Andrews Sisters, The Glenn Miller Orchestra and Doris Day among others. Songs of Victory includes singalong sections and audience participation and promises to take you on a nostalgic and humorous trip down Memory Lane as the cast pay a sentimental tribute to the popular songs of the time, as well as sketches and poems that played such a big part in keeping up the morale of servicemen as well as everybody at home. The show starts at 7:30pm at Filby Village Hall on Main Road, Filby, NR29 3HN. Tickets are £8 in advance or £10 on the door and available from www.sarahprobert.co.uk or on 07496 041768 or 07909 510976. There has recently been some damage caused to the Scratby beach gabions; Great Yarmouth Borough Council are aware of the situation and will be taking action. In the meantime we urge local residents and members of the public to keep clear of this area until they have been repaired. ScottishPower Renewables (SPR) is currently building the 102 turbine East Anglia ONE offshore windfarm off the coast of Suffolk. This project will be followed by the East Anglia THREE offshore windfarm which received development consent last year. A meeting to discuss the potential of setting up a Community Land Trust, or Trusts, covering the northern parishes will take place at All Saints Parish Hall, Beach Road, Scratby on Tuesday 13 March 2018 at 7pm. All residents are invited to attend. Great Yarmouth Borough Council is exploring Community Land Trusts as a way for communities to take the lead on bringing forward new affordable homes within their own areas. Not for profit membership organisations main aim is to ensure these homes are genuinely affordable based on what people actually earn in their area not just for now but for every future occupier. The meeting on the 13 March follows a positive initial gathering in December which aimed to gauge community interest in setting up a Trust or Trusts for the north of the Borough. Ormesby St Margaret with Scratby Parish Council would like to wish all it’s parishioners a very happy new year. The closing date is Friday 22nd December 2017. Do you or a relative need extra support during a power cut? UK Power Networks can help, their services are free to customers who need it. Power cuts don’t happen very often but if the electricity network is damaged or develops a fault it’s UK Power Networks job to get your power back on. Their engineers will work around the clock 24/7 to restore your power as quickly and as safely as possible. To give you peace of mind, if you live in London, the East or South East of England, then being on their Priority Services Register will ensure you will receive extra support if you experience a power cut. For further information visit their website at www.ukpowernetworks.co.uk and complete the Priority Services Register Form, or call 0800 169 9970. 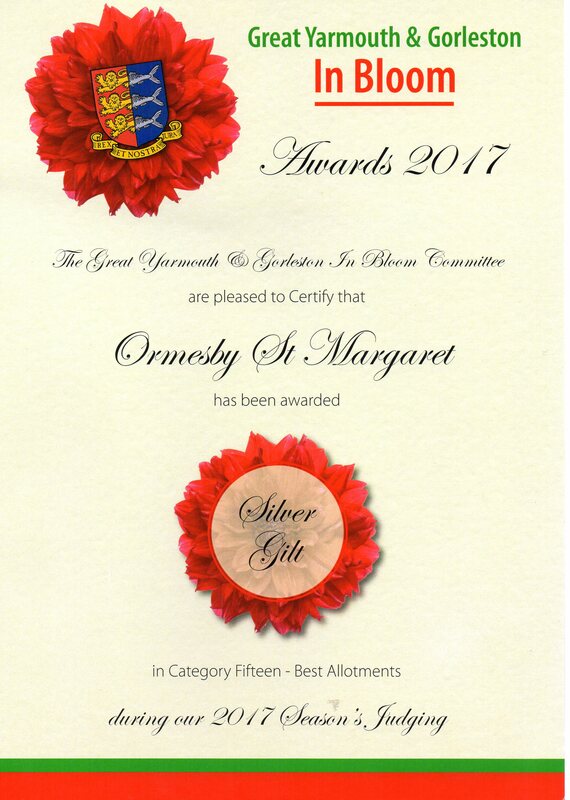 We are pleased to announce that the Parish was awarded silver in the category of ‘best village’, and the silver gilt in the category of ‘best allotments’. Congratulations and thank you to all those who contributed. 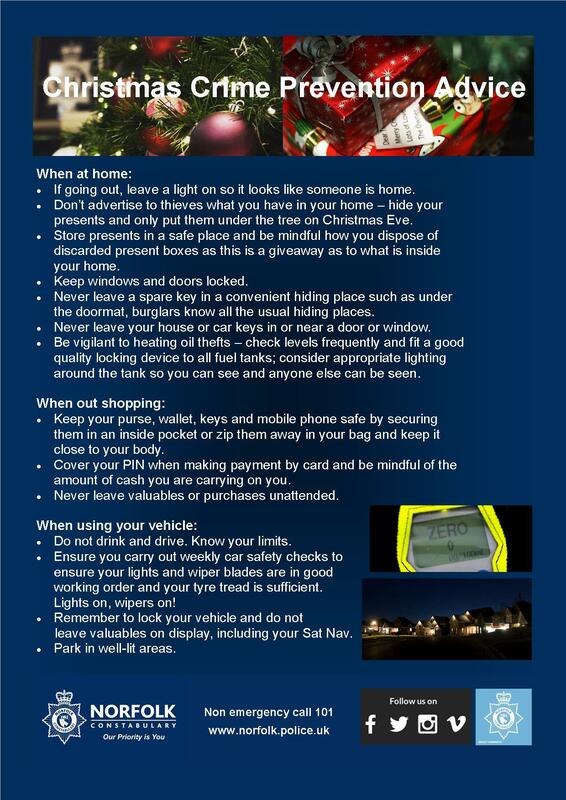 It’s that time of year again, and with the festive season approaching Norfolk Constabulary urge people to think about crime prevention. Click on the poster below for their words of advice. The closing date is Friday 3rd November 2017. The public toilets located on Rottenstone Lane, Scratby will now be closed for the winter. However, they will be open for use during the October 2017 and February 2018 school half terms. Would you like to volunteer for Ormesby and Scratby Community Speed Watch? 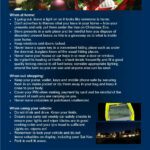 What is Community Speed Watch? The scheme involves local residents partaking in speed reduction activity; speed monitoring is carried out by trained volunteers from the community, with follow-up work on education and enforcement by Norfolk Safety Camera Partnership, Norfolk Police and the Local Authority. At the next Parish Council Meeting, being held at 7pm in All Saints Parish Hall on Monday 11th September 2017, the council are pleased to welcome PC Gardiner and Inspector Hewitt. They will be discussing neighbourhood watch and community speed watch. All parishioners are very welcome to attend. Please be aware the Caister Costal Villages & Rural Flegg Villages ‘Safer Neighbourhoods Action Priority’ meeting is arranged for Wednesday 13th September 2017 at 19:00 hrs. It is being held at The Community Centre, Playing Field Lane, Martham, NR29 4SP. This is a public meeting where local policing issues and priorities are discussed and prioritised with local officers and local residents. Soundwaves Community Singers are an enthusiastic singing-for-fun group who meet 7pm every Thursday at Hemsby Sports Pavilion. We believe everyone can hold a tune and singing is not only good for your health, but fun to be enjoyed by all. There are no auditions. We charge £5 a month to cover the hire of the hall. To report a streetlight not working check the number on the column. If this number ends in ‘R’ it is a Great Yarmouth Borough Council streetlight and any fault can be reported directly on 01493 742194 or on the website for Gt Yarmouth Borough Council. As members may already be aware, overnight the Secretary of State approved an order to make the whole of England an Avian Influenza Prevention Zone for the next 30 days, in order to help protect poultry from a strain of Avian Influenza in Europe. Outbreaks of a highly pathogenic strain of Avian Influenza have been confirmed in poultry and wild birds in several countries in Europe. No cases have been found in the UK and this Order is a precautionary measure to help prevent potential infection from wild birds. Poultry keepers are being urged to reinforce biosecurity measures at their premises. Public Health England advises that the threat to human health remains very low. Please see a new reference document in Parish Council Services for use in emergencies.